The "Sheep" referenced in prophecy are actually powerful representatives of HaShem, the conception of the Ek Devata (the One God) granted to the Jewish people, Noahides and Noahide Nazarenes. God is One, the Sages use diverse terms. The Sheep have a very specific raison d'être or reason to exist in this world. Understanding this reason is the topic of this piece. The Master informed us that, "Many are called, few are chosen." The Sheep are the Called Ones and they exist to advance the Kingdom of the One on this earth. Their service is to resist the influences of the "Goats," who seek to counter the advancement of that Kingdom. This struggle between the Sheep and the Goats is the story of human history. What does this mean? Jews throughout the ages have been waiting for the coming of their Moshiach or Messiah. As I've discussed at various places, (here for example), the essential role of the Moshiach is to establish global peace by implementing the Kingdom of the One on Earth. Master Y'shua did not accomplish this and much of what is believed concerning him, including the very name "Jesus," is based on the overlay of Roman Paganism. I discuss this elsewhere. The Kingdom of HaShem and hence the coming of Moshiach who will establish it, is yet to come. The Sheep are on the front lines of bringing about the Kingdom of HaShem and resisting the Kingdom of the Rex Mundi. This is our service. "I will bless those who bless you, and I will curse him who curses you. In you will all of the families of the earth be blessed." HaShem, the Ek Devata or One God, is God over all, both Jews and Gentiles. This Being is not only the God of Israel but the God of the whole world and beyond. According to the biblical record, as this present age dawned the first covenants were made with all of mankind, not only with the Jews. These are known as the Seven Noahide Laws (Click here for more on this). In time Abraham and his descendants were selected for a specific task, to lead in the establishment of the Kingdom. The biblical record is the account of God's dealings with this particular body of people. Through their efforts all the world will be blessed and brought into the Light of Truth. But for everything there is an opposite. Just as the Moshiach is put forward to be Ruler of the Kingdom of Light, so too the opposite. There is another kingdom and another king being offered to the earth. This is the nature of the Rex Mundi or Antichrist, known by the Muslims as the Dijal, in the Hebrew Tanach as the Little Horn and in Paul's prophecies as the Son of Perdition. According to the clear words of the prophets the Rex Mundi will be an individual human being who will rule a planetary government harmonious with the power and under the authority of Lucifer. His Kingdom is now almost ready. This instruction and warning was fundamental to Paul's teachings. It was not simply a side issue for discussion at dinner parties! As I've stated elsewhere, the Bible is fundamentally the Story of Paradise Lost to Paradise Restored. That is the Bible's central message and central to this message is that the Rex Mundi must be resisted throughout our generations (I John 2:18). Now that his direct reign is clearly in sight, this instruction has never been more timely. The Sheep are those who Stand. What were they told? They were given their orders as ambassadors of the Kingdom! 6 And now ye know what withholdeth [or hinders] that he might be revealed in his time. Note that there is something "withholding" or hindering the coming of the Kingdom of Rex Mundi. During this period of hindering, which Prophet Y'shua referred to as "the Times of the Gentiles" (Luke 21:24), the faithful Sheep would stand against and seek to hinder "the spirit of antichrist." Once the Times of the Gentiles ends, which happened in either 1948 or 1967 with the return of the Jews to Zion, we are called to hinder the rise of Rex Mundi, the person of Antichrist. Once he take his globalist throne we will stand against him directly. This is the role of the Sheep! Weymouth's has it like this: "And now you know what restrains him, in order that his true character may be revealed at his appointed time." Even the popular New Age paraphrase the NIV tells us: "And now you know what is holding him back, so that he may be revealed at the proper time." The NIV tends to downplay the person of Antichrist (II John 1:7 for instance), but here even this faulty paraphrase is clear (for more on the NIV Click Here). The clear message of the prophets is that an individual dictator will one day reign over a global Luciferian kingdom seeking to prevent the Kingdom of HaShem from being established. The leader of that kingdom, the Rex Mundi, will exalt himself above God and proclaim the establishment and implementation of the New Secular World (Novus Ordo Seclorum). And this is precisely what is now being finalized. 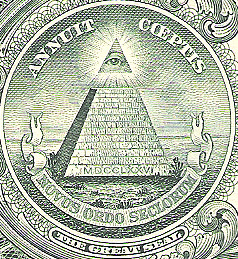 In which "God" does the Novus Ordo Seclorum Trust? Certainly not in the God of Light! The Novus Ordo Mundi (New World Order) is the repositioning of the nations of earth into economic unions (the European Union -- EU -- the North American Union --NAU -- South American Union -- Unasur and Unasul -- The Asia Cooperation Dialogue -- ASEAN -- and so on). Once these unions are established the Rex Mundi (world king) will unite the economic unions under his own authority and the Novus Ordo Seclorum (the New Secular Age) will be realized. The Sheep oppose this development as they can in various ways. It is important to understand that this move toward world government did not begin with the attacks of September 11, 2001, nor with the Federal Reserve Board in 1913/17, nor yet with the Templars and Masons. This battle has been under way since the beginning of our age 6000 years ago. 7 For the mystery of iniquity doth already work: only he who now letteth [hinders] will let [hinder], until he be taken out of the way. Luke 4:5 And the devil [Lucifer], taking him [Master Y'shua] up into an high mountain, showed unto him all the kingdoms of the world in a moment of time. This has been Lucifer's goal for a very long time. It is about to be realized. While Lucifer has been quite successful at convincing the world that he does not exist, the Elite know better and soon his existence and active involvement in our affairs will be undeniable. So here we have it. Two powers: the Sheep and the Goats. The Sheep seek to encourage goodness and freedom, the Goats seek to encourage iniquity and subservience. The goal of the Sheep is to "hinder" the rising powers of Darkness and enhance the Light. When the Goats propose, the Sheep seek to dispose. When the Sheep act, the Goats to undermine. This interplay between the groups is the history of our present age. It is the role of the Sheep to stand and resist evil and the Evil One. This struggle has been the history of the past 6000 some odd years. It is the fundamental reality of human history. The goal of the "Goats" is to increase iniquity and ultimately to bring in the reign of the Rex Mundi and his Dark Kingdom. Paul tells us clearly in this section of his prophecy that the establishment of this Luciferian kingdom was not in sight in his day (first century CE) and he warned his hearers of this fact. But one day it would arise! Rev. 13:13 He [the coming false prophet who will serve the Rex Mundi from Rome] performs great signs, even making fire come down out of the sky on the earth in the sight of men. 14 He deceives my own people who dwell on the earth because of the signs which it was given him to do in front of the beast [ie in front of the Rex Mundi]; saying to those who dwell on the earth, that they should make an image to the beast who had the sword wound and lived. 15 It was given to him to give breath to it, to the image of the beast, that the image of the beast should both speak, and cause as many as wouldn't worship the image of the beast to be killed. Signs and wonders! Shock and awe! Wonders so amazing that even many of the Sheep may be deceived! As certain as the prophecies that have already been fulfilled, these will be as well. The Sheep are those who stand in opposition. Even as the darkness continues to descend over the earth, even as our nations fall before the coming king, so too take comfort in knowing these very days were foretold and that in time they too will pass. The job of the Sheep: To Stand! Are you a Sheep? Are you a holder of the Light? Then your job is to Stand! Stand against all matter of evil! Not sure if you're a Sheep or not? Stand and be counted and you are a Sheep! Stand and you are among those who are called! And perhaps you will be chosen for greater service if your service comes from the heart. I will bless those who bless you [Israel], and I will curse him who curses you. In you will all of the families of the earth be blessed." And there shall be one fold, and one shepherd." There are those who maintain that only Christians are the Sheep. That only they have the blessing of the One God. But what does Master Y'shua say to the Christian Church of the Last Days? Rev. 3:15 "I know your works [Christian church], that you are neither cold nor hot. I wish you were cold or hot. 22 He who has an ear, let him hear what the Spirit says to the assemblies." It's a question of Will, intention and devotion to the God of ones understanding. Micah 6:6 How shall I come before Yahweh, and bow myself before the high God? Shall I come before him with burnt offerings, with calves a year old? 7 Will Yahweh be pleased with thousands of rams, [or] with ten thousands of rivers of oil? Shall I give my firstborn for my disobedience, the fruit of my body for the sin of my soul? 8 He has showed you, man, what is good; and what does Yahweh require of you, but to do justly, and to love kindness, and to walk humbly with your God?